Kids Ballet Classes at The Dance Hub are taught in a fun and supportive environment. Developmentally appropriate exercises are taught in a way that stimulates the child’s imagination and unleashes her/his creativity and self-expression in movement. Children will build self confidence as they learn coordination, mobility of movement, posture, and rhythmic and musical awareness. Through dance class etiquette, kids will also develop their social skills as they learn to work constructively with others. In addition to ballet fundamentals, our program will emphasize performance skills and choreography and all kids will be encouraged to participate in a studio performance at the end of both the Fall and Spring terms. The Dance Hub is committed to providing a safe, instructive, and joyful dance experience for all children. Want more information? Fill in our form here. Mommy and Me (or Daddy or caregiver) will introduce your child to creative movement and ballet in a fun and supportive environment. We begin with playful seated stretches, followed by dancing with tambourines and scarves, to ballet classics and Disney favorites. This class encourages freedom of movement and self-expression, as well as coordination, and rhythmic awareness. In your child’s first dance class she/he will also develop greater socialization skills and gain confidence as you and your child experience the joy of dancing together. This class emphasizes creative movement and self-expression together with developmentally appropriate ballet fundamentals. 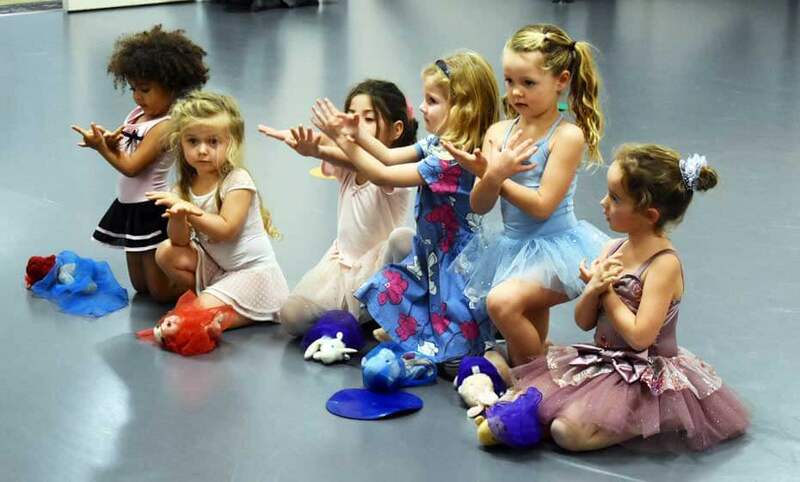 In a nurturing environment children will learn the first exercises of the ballet barre, such as first and second position, demi plié, and tendu. They will also enjoy jumping, galloping, skipping, and leaping along with other locomotor movements. Students will develop performance skills and musical awareness as they learn short dances from a classic story ballet TBD, to be performed on Monday, March 18. Children will learn and strengthen their ballet fundamentals including stretching and barre work, center floor exercises, and class etiquette and protocols. As in Pre-Ballet, there is emphasis on creative movement and self expression and performance skills are cultivated as children learn dances and prepare for a studio presentation during the final class session. Ballet IA – Thursdays – 4:00-5:00pm 7-9 years (Carrie Diamond) New Class! Between the ages of 7 and 9, some children are ready for more technical instruction. Ballet 1A follows the curriculum of Ballet 1 but with more emphasis on technique. Personal expression and improvisation remain part of this class and students will enjoy more challenging structures for creative explorations. Performance skill development is cultivated as children learn dances and prepare for performance. Ballet II – Wednesdays – 4:00-5:00pm 9-11 years (Carrie Diamond) New Class! At these ages, students are physically ready to start more focused training. Barre work is extended to build strength and flexibility, develop turnout, and learn the correct use of the feet and arms. Center work includes exploration of the positions of the body, port de bras, arabesque, and developing vocabulary and learning steps like the Polka and Waltz. Expressivity and artistry through movement is taught as an integral part of the work. Creative explorations are incorporated in every class. For Mommy and Me, Pre-Ballet, and Ballet I/IA: Kids should wear clothes they are happy moving in. Dancewear, tee shirts, shorts, and leggings are all good options. Ballet slippers can be worn but are not required. Long hair should be pulled back. For Ballet II: Girls should wear pink or neutral ballet slippers, a leotard and flesh-colored or pink tights; boys should wear black ballet slippers, a white tee shirt, and black shorts or tights. Long hair should be secured off your child’s neck. Where can I purchase dance clothes for my child? You can purchase dance clothes at Discount Dance Supply at https://www.discountdance.com/kids. Some items may be available at Santa Barbara Dance Arts. Call Carrie Diamond at (805) 450-7535. Click on the “Sign Up” button for the class you want for your child. You will be asked to log in or create a new account. If this is a new account, you can register your child at this time. See Step 4 below. If you have not registered your child, you will receive a message that this course “has a reservation prerequisite that isn’t reflected in your information at The Dance Hub”. To register your child, click on the “My Info” tab and then click on “Add a Family Member” on the right. Click on the “Courses” tab and find your course and try again. If your child is registered and the correct age, you will see a blue button to enroll your child. If you have any questions, please email info@dancehubsb.org or call (805) 450-7535.